The pilgrimage toward our–fully human, real-deal, nothing left-behind Self, might take us down some scary roads. But if we keep our eyes open, just as we’re about to lose our way, a stranger will come along and point us in the direction of hope. So let’s keep remembering that the greatest light is the light that comes from darkness. We can wait for a miracle. Or be one. We can wait for someone to show up for us. Or learn what it takes to show up for the hopeless, lost strangers in ourselves, and then bring a little light to the next person we meet that seemed to have lost her way. My miracle challenge this year is to remind ourselves that we are the miracle makers we’ve been waiting for. You and I are the rescuers that can answer each other’s prayers. If we are to make it out of darkness we must be brave enough to let someone know that we need them, and brave enough to make real, human contact with someone who needs us. Takes guts to do both! Let’s light up each other’s worlds with the miracles only you and I can deliver! Something struck me during our recent school tour for our toddler. One of the schools said that they are practicing a growth mindset in the classrooms. That means that the kids are encouraged to avoid saying – I cannot do this, or I do not know how to do that. Instead, they are encouraged to say: “I am not there, YET”. And so as you say “we are the miracle makers we have been waiting for” – I may not be there YET, but I know that I can be a mom of 2 with practice and support! Thank you Julia and FH community for being here! I have been reading the blog and the forum threads while I was away from work and home. I am grateful for this opportunity to step away from both and to find myself better connected with my roots. I came back emotionally refreshed and with a renewed sense of self-worth. I hope and pray to Almighty to allow me to feel this gratitude and this state of mind more often and more strongly and to strengthen my connection with my roots and my rightful and rich heritage. Although I have missed the practice in the rigors of travel and the joy of forming new connections and renewing old ones, I am ready to dive in now. I started with listening to the Body Truth introduction on my train commute. I am still settling down into the daily routine with work and back to struggling to nourish myself. And I have felt overwhelmed at times but I am ramping up slowly and taking baby steps. Today I made a juice for myself probably for the first time in the last 30 days. Thank you Julia for the call on Monday with Dr.Spence. And it was simply lovely to read about Brave Caterpillar in the newsletter! If you are reading this, sending you love & hugs. In closing, hope it’s time for a new blog post! And looking forward to connecting with you all on Monday. I see the miracles showing up for me in the wonderful souls who are a part of the Fertile Heart community. My husband is also being awesome in his support of me in not getting the job I was hoping for after going through the training. Showing up for Birthing, yay for showing up for yourself and heather1975teaching good luck with sharing your desire for another little one Bel, I’m glad your surgery went well and so wonderful to have felt support. I did write a letter expounding on how I would be awesome at the job that was not offered to me, but chose not to mail it. It felt healing to write it and thank you so much, Julia, for the idea. I have orphans popping up about not feeling good enough and my understanding is there are usually 2 orphans in this case, the one who doesn’t feel good enough and the accuser orphan. I have seen these two before. I’m trying to comfort them without putting them in charge. I’m getting back to the job search plan. 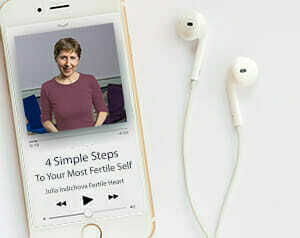 I have been doing Rock the Baby Fertile Heart body truth and Learning How to Ask Fertile Heart imagery. This blog post speaks to me in more ways than one. I want to always be able to find the light amidst the darkness – political and personal. It is not so easy right now. As I struggle with my orphans, I hold strong to the idea that light can be found – that this journey will make sense and yield great things one day. It’s not that it doesn’t already make sense, or that it hasn’t yielded great things as of yet. But I want more. I want to find myself in totally new territory. I can imagine it and I’m working toward it. Sometimes perhaps we just need to trust that the light is there and we must keep walking, trusting it will show itself in time. At the moment, I’m fumbling around, tripping over my own feet and banging into walls. But I feel enough forward motion that I can keep going, that I want to keep going. I know that at least one light to be found here is a stronger, wiser, clearer and more whole self. So I will continue forward in the darkness – knowing there are new types of vision to be gained – knowing that the light will show itself as long as I keep showing up. I’m deciding in this new year to trust that showing up for myself, over and over, is all I have to do and the path will eventually become illuminated. Thank you Julia for helping us to acknowledge both the dark and the light – and to trust that the light within us is always within reach if we are open to and inviting of it. I think letting someone know you need them is the ultimate act of trust, you are opening yourself up to show your most raw self, placing part of yourself into their safe keeping. It can be a simple as saying out loud, I am trying ( again) to get pregnant and it is such a journey. Truth and trust go hand in hand on the path to meet our children. Since my little one has hit the one year mark, people have been asking when we are going to try again, when in reality we have been trying for nearly 10 months. Saying out loud that yes, we would like another is hard because my orphans feel like everyone is now going to be judging me when I am not getting pregnant. FH is my light in the darkness during those times when I feel overwhelmed. Thank you all for that. As I reflect on the year that is almost at its end, one of the things I am most grateful for (and perhaps most surprised by) is how, in this moment, I feel connected to a brightness within in me. This feeling of brightness (or call it joy/gratitude) is certainly not because it’s been an entirely smooth year, or the year when I finally got to meet my child. In fact, my fertility journey has had plenty of moments that have brought me to my knees and I’ve also just been through a pretty major surgery, which I’d been dreading (but actually has all gone very well). I think this brightness is there because I have been showing up for myself & doing the work: tending to my thousand and one orphans; and also reminding myself again and again of all the wonderful things I do have in my life; daring to trust, just a little bit, that my journey is unfolding as it is meant to; becoming open to different pathways towards my child than I would have originally envisaged. At the start of this year I was anxious that if I got to the end of this year and still wasn’t pregnant (& a year older! ), plus had put myself through this surgery (which I’d been contemplating for a long time) I would feel quite depressed. The reality right now feels quite different. I still find it quite hard to ask for help from others, though am working on this (even though I am almost always glad when others reach out to me for support, so I’m not sure why I struggle with the opposite side of the coin!). I did manage to tell a few people I didn’t think I would that I was having surgery and the support I received from most of those people was really beautiful. I didn’t actually need a lot of physical support as I was able to look after myself once I got home from hospital, but receiving cards, messages, phone calls was so lovely, and certainly helped to light up my world. Julia, thank you for showing up for me and for all of us. And thanks to everyone else in the FH community for showing up, as without one another we wouldn’t have this community. Wishing everyone a very happy 2017. Julia, thank you for this blog. One of the things that has been a muracle for me is that where I am training it is a beautifully diverse environment. My permanent job, which I will start Monday, is not as diverse, so I will miss that. My miracle for other people is showing caring and a smile for people who are customers where I am training, whether I feel cheery or not. It is my gift to them. Wonderful about the Inside Out movie, gutsymama and will be a mother is great and great to hear from you Sulli612. I have been doing Rock the Baby Fertile Heart body truth and Orchard of Possibilities imagery. I’m still working on how to manage my schedule to be more nourishing. Love this posting. Indeed. Let’s help guide each other out of the darkness. Happy holidays Julia. Happy Holidays to you Julia and all of Fertile Heart! My husband told me today I will be a good mother. Not might be or maybe – but WILL be. I believe him! I believe he WILL be a wonderful father as well. I recently watched Inside Out again- which if my memory serves me right I discussed that movie with FH before. It was touching how in the end “sadness”is what brought her back to herself. She allowed herself to feel the sadness and not try to “cover it with happiness”. To feel my orhpans and feel what it is I need to feel without ignoring it or covering it up allows me to live everyday as a gift. Thanks Gutsymama..I think I also need to feel my orphans fully without running for cover each time they show up. Now is one such time.